NJSI has supported 11boys and 6 girls from Dhading Districts for computer, electrical and tailoring courses at Don Bosco Institute of Engineering & Technology, Thecho, Lalitpur. 10 boys have completed computer and electrical course this month. During this course the trainees were assisted to inculcate discipline and good habits that makes them a different persons and look at their lives positively. They also were taught spoken English that help them to understand English better and try to speak in English. As the 10 boys completed the computer and electrical course, the institute organized ‘certificate distribution ceremony’. As NJSI is supporting these boys, NJSI staff went to participate in this ceremony. During this ceremony Fr. Augusty Pulical SDB, the principal of the institution, invited the guest and addressed the gatherings. He spoke about the importance of the learning and wished all the best to the students. Likewise Fr. Roy Sebastian SJ, the director of NJSI also was invited to address the assembly. He too stressed on the importance of learning and helping each other. The teachers also were invited to speak to the students and inspire them as they completed the course. Two of the students beautifully shared their experience of being in this institution and having unique experience. As the addressing part of the programme was over, Fr. Roy Sebastian SJ was invited to distribute the certificates to the students. He distributed certificates with immense joy. 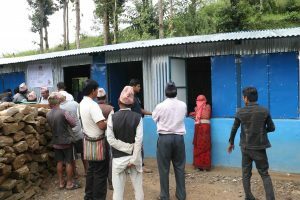 It is more than a year the students of Panchakanya Primary School located at Mankha-9 VDC; Sindhupalchowk, were without proper class rooms after the earthquake destroyed their school building. NJSI has taken the task of making a semi-permanent building for the school more than six months ago. However, the construction work delayed due to lack of proper allotment of land to build the structure. Once it was done the building started and now completed. The block will have two big rooms, one of it being ECD for the small children. The school has suffered children leaving the school due to lack of facility. Now they hope to have more children in the coming year. On 21st September 2016 NJSI handed over Panchkanya School to the School Management Committee. This day was the awaited for all as once again children could have suitable education environment. The chairpe rson of NJSI Fr. Boniface Tigga SJ, Director Fr. Roy Sebastian SJ, and District in charge Fr. Arulanandam SJ and field staff Mr. Chandu Chaudhary went to Manka VDC, Panchkanya School to officially hand over the school to School management committee and to the Principal, Miss. Jamuna Dha. The key of the school was handed over to Mr. Shyam Thapa, a resource person from Education department of Sindupalchowk. On this joyful occasion the member of School Management Committee, Teachers, Parents and students were gathered to express their gratitude to NJSI. Fr. Boniface Tigga SJ, Fr. Roy Sebastian SJ and Fr. Arulanandam SJ assured their support to the gatherings and wished them all the best for their future endeavors. The children felicitated the gatherings and NJSI staff by welcoming through culture dance, songs and poems. Apart from constructing school NJSI also provided uniforms, School bags, Shoe, Socks, ECD kits, Carpet and furniture for the students and teachers as well. Shree Ban Sangu Secondary School located at Jure VDC in Sindhupalchowk district which was affected by catastrophic landslide and flood on 2nd of August, 2014 is in great need of intervention. More than hundred persons died in the landslide and thousands of students are deprived of education. Presently, there are about 200 students studying in pitiable condition, compelled to stay under a tents and poky temporary learning centres. Moreover, the massive landslide had blocked the river and formed a lake at Jure in Makha VDC, destroying a kilometre section of Araniko Highway. As per the assessment, Nepal Jesuit Social Institute has decided to help the school in building semi-permanent classroom. Nepal Jesuit Social Institute assessed approximately 28 km vehicular movement track road from Somdang to Tipling in Dhading district on 5 September 2016. FR. Joseph Pulickal S.J, Financial Manager and Project Adviser of Nepal Jesuit Social Institute along with staff Mr. Lawrance Lama, Field staff, Asst. Engineer Tikaram Regmi, and Survey Engineer Mr. Purna Dhital inspected the site. There is active cooperation of the locals for the construction of the track road. The people from Sertung, Lapa , Jharlang and Tipling VDC will be directly benefiting from the construction of road track. The construction work approximately will take one year. 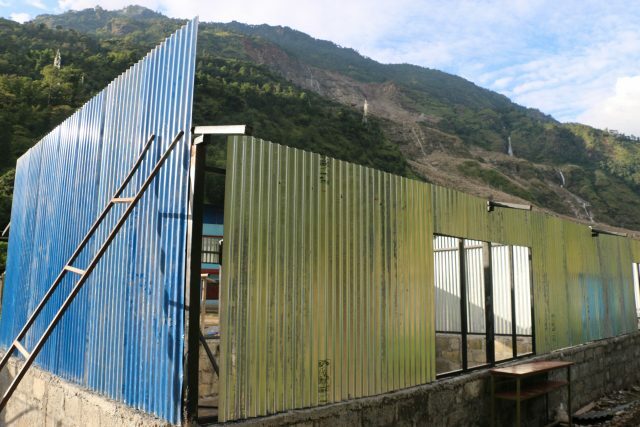 Mr. Ram Bahadur Tamang, a resident of Tipling VDC said that the construction would help the people to sell their products and purchase daily essentials easily. Moreover, the construction of the track road will help develop trade, commerce and tourism in Tipling VDC. Due to its remote location Tipling is still on “off the beaten track destination”. Meanwhile, NJSI has received an approval letter from Local Development Office on 12 September 2016, to begin the work of construction. 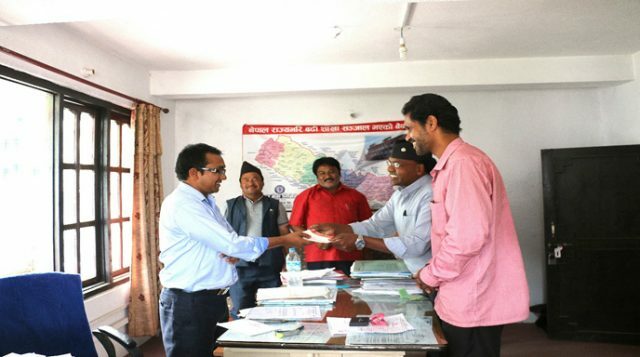 The cheque of NPR 36,50,000/- was handed over to Mr. Ramchandra Bishwakarma, the bank manager of Nepal Bank Limited, Melamchi, Sindhupalchowk in the presence of five representatives from Mahakal VDC. It was the first tranche and NPR 50,000/- will be transferred to each beneficiary’s account as per the Government Regulations for executing the Shelter Reconstruction for the Earthquake victims. The rest of the amount of the total of NPR 200,000/- will be granted in another two tranche after assessing the process of the house construction by each beneficiary as per the Govt. regulations. As we ride through the majestic Nuwakot palace, we reach Bhairavi school, where a 5 room hostel for the special children is coming up. Located in a picturesque surroundings, the dedicated craftsmen with brick by brick build this beautiful building. 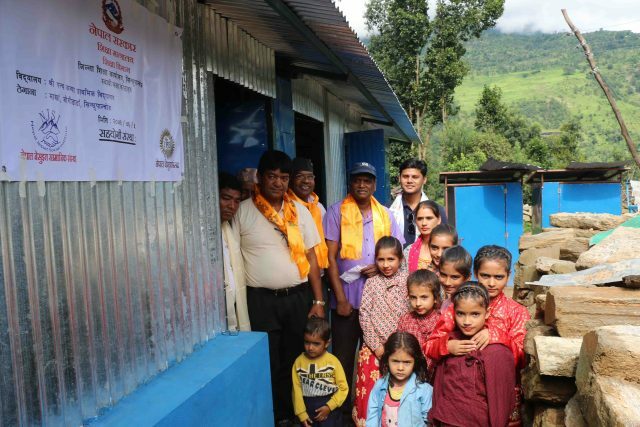 They area aiming to present the completed building as the special children arrive after their Dashain holidays. Further climbing the uphill for around 12 more kilometers is the Bageswari school. This historical village Chokade is overlooked by huge mountains. Here to another hostel work is in progress. This hostel will is built for some 20 special children studying in this school. The earthquake has destroyed their old hostel completely and they were all living in a small room where they cook, eat food, sleep and study. The new building will be of great help for the children. We are hoping to finish the building as early as possible. As we cross across the mighty and fiery Trishuli river running under through a hanging bridge comes the Chandeswari school. The third hostel for the special blind children is coming in this school premise. The work is progressing steadily. 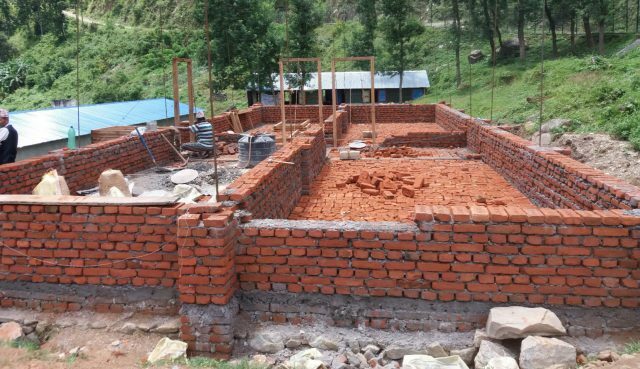 A four roomed hostel for the mentally challenged children of Shree Janajagriti Higher Secondary School, Sangachok in Sindhupalchok district is the fourth hostel under construction. The construction of the hostel for special children has started after following the long government procedure and with good spirit of team work. The school had a hostel for mentally challenged children but the hostel was destroyed in the 25th Arpil 2015 Nepal Earthquake. Because of this these special children were out of school till this time. Many have not returned to school due to the lack of proper environment for them. Construction of their hostel would give them the needed facilities to come to the school.